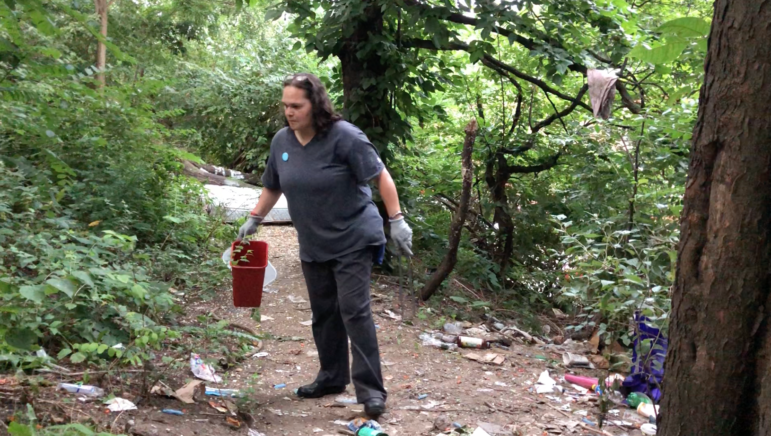 Clara Cardelle picks up used syringes in a drug use hot-spot. Clara Cardelle walked out of the Washington Heights Corner Project onto West 181st Street and into New York’s humid August heat. She set down her bulging black bag to light a cigarette, without removing her purple latex gloves. A sharp inhale marked the beginning of her last community outreach shift for the day. Cardelle set her kit down again and opened it, her cigarette hanging from her lips. She reached down to grab two “one-shots”—plastic bags containing three syringes, alcohol wipes, a cooker for drugs, distilled water, cotton and Band-Aids. The man with the hat looked up, accepting the bag with more orange-capped syringes. The tall man in the doorframe took his and started fiddling with it, opening and closing it as he felt its contents. “What’s your code?” Cardelle said. Each client who uses the Corner Project’s services has a code—a series of letters and numbers to maintain some semblance of anonymity in this marginalized part of society. Cardelle scribbled it down on a sheet of paper, closed up the bag and continued walking as a drizzle began falling. A blue pouch containing naloxone, an anti-overdose drug, swung from her belt as she entered Highbridge Park. Down the path she veered to the right into a small clearing where she found dozens, maybe even hundreds, of orange caps and used syringes littering the ground. Cardelle set down the bag again, this time retrieving an orange waste basket, a triangular hazardous material logo emblazoned on its side. She grabbed thick rubber gloves to cover her latex ones before picking up tongs. Cardelle scanned the area and started picking up syringes, one by one. These were likely some of the 20,000 syringes that the Corner Project distributes monthly. Cardelle is on the front lines of the opioid epidemic in New York City. On any given day, she and her team, which operates the Corner Project’s syringe exchange and pick-up program, collect as many as 600 syringes in a single local park. The de Blasio administration has proposed a new approach to the opioid crisis that would create safe spaces for IV drug users to shoot up. But it has been stuck in bureaucratic limbo for months, during which time the other options confronting people who are addicted have dwindled. In New York City, nearly 1,500 people died in 2017 from drug overdoses—a record breaking number driven largely by fentanyl, a potent synthetic opioid. There are over 100 safe injection sites across 10 countries, most of which are in Europe. Canada and Australia also host such sites. New York is one of several cities across the United States, including Philadelphia and Denver, considering opening the nation’s first safe injection sites. Overdose Prevention Centers, or safe-injection sites as they are generally called, are places where people can inject drugs intravenously while under the supervision of medical staff. The centers do not provide the drugs; they just provide a safe place to consume them. If a drug user overdoses, a trained professional will be able to provide medical help. The idea is to also have social workers and various resources at the centers to connect drug users to treatment programs if they choose to get help. Critics claim these sites increase and enable drug use. People practicing harm reduction—an approach aimed at minimizing the damage of drug use—say addicts are going to use anyway, and these centers are key to ensuring that they don’t die. If approved, Overdose Prevention Centers will be official research pilots where the effectiveness of safe injection sites in the United States can be studied, said Greg Wersching, Director of Project Management at Housing Works, one of the four organizations planning to operate the safe-injection centers in the city. Scientific studies from other countries have found that at best, these sites reduce overdose deaths, risky injection behavior such as sharing needles, and the transmission of infectious diseases like HIV/AIDS. At worst, they have little impact. 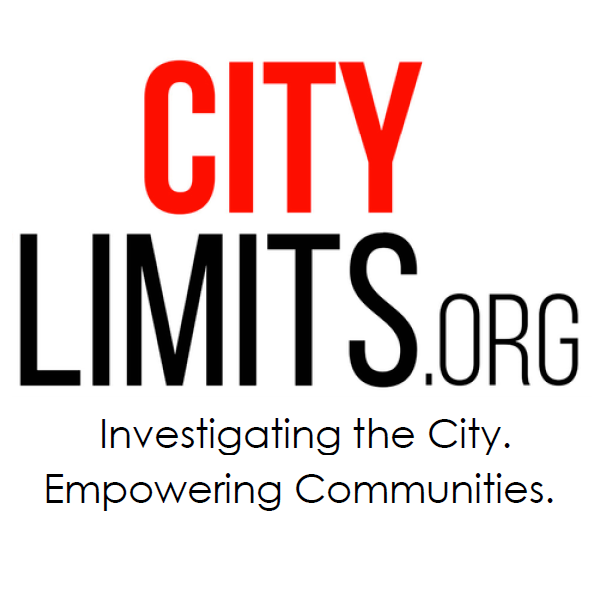 The Justice Department has threatened to take legal action against any city that opens such sites, as advocates, including the Corner Project, have doubled down on their push for what they view as a necessity in the midst of the opioid epidemic. Another large hurdle remains: approval by the New York State Department of Health. The coalition of organizations fighting for the centers are working with the department, but no one knows if or when the department will approve their proposal. The Corner Project has faced obstacles of its own. In September, the organization was evicted by its landlord in a dispute over rent. Its IV drug user clients now roam the streets with one fewer safe spot in the city. Used needles at Highbridge Park. For now, the city’s injection drug users are largely confined to consuming opioids in the streets or unsafe environments like “shooting galleries,” places where users convene to take drugs, often dealers’ homes. Billy Garcia, 43, is a manager at the Corner Project. He works on testing injection drug users for Hepatitis C, a chronic infectious disease that affects the liver and leads to liver failure and cancer, and connecting them to treatment. As a former dealer and user himself, and someone who works with injection drug users every day, he knows how dangerous shooting environments can be. Another risk factor for injection drug users is sharing equipment. Because of the work that the Corner Project and other community-based organizations do to educate drug users, sharing syringes has become less common, Garcia said. The bigger issue is when people share cookers, a small pan-like container the size of a quarter where users dilute their drugs before putting them in their syringe. If multiple people are using the same cooker, and an HIV- or Hepatitis C-positive person injects themselves and uses the same needle draw out more drugs—or “double dips” as Garcia calls it—everybody using that cooker is at risk of being infected. The Corner Project and 22 other organizations in New York conduct syringe exchange programs with community outreach specialists like Cardelle so that people will have access to clean injection supplies and reduce their risk of catching HIV or Hepatitis C.
Overdose Prevention Centers would help make supplies more accessible to users, advocates say. Before the eviction, the Corner Project had been unique among organizations serving injection drug users. In addition to providing clean supplies, it provided two monitored bathrooms where users would shoot up heroin. The nonprofit did not condone illegal drug use there, but the bathrooms were an effort to keep users safe from overdosing. This was the closest thing New York had to a safe injection site—and far from ideal. If a visitor at the Corner Project wanted to use the bathroom, he or she would have to sign a sheet with their code. Every couple of minutes, a staff member would check on the person in the bathroom from the outside. If the person inside did not respond, the staff member would unlock the bathroom. This way, if a drug user accidentally overdosed, he or she could be revived in time by a dose of naloxone. This bathroom shooting gallery arrangement was less than hygienic. Most harm reduction workers say bathrooms should be the very last resort. 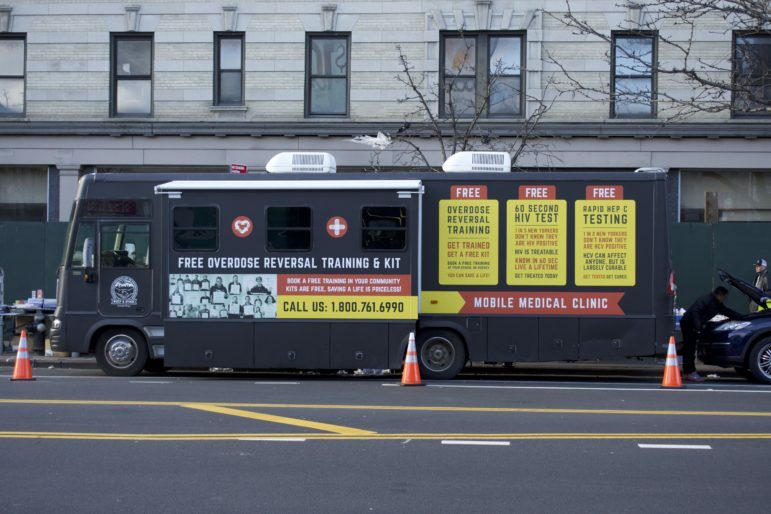 There’s nothing safe about injecting in the most unsanitary places imaginable, said Van Asher, a harm reduction program manager at St. Ann’s Corner Project in the Bronx, one of the organizations pushing for overdose prevention center. Injection drug users turn to bathrooms out of necessity, Asher said, usually because they can use the running water to dilute their drugs. “Bathrooms are not similar to safe injection sites. There’s nothing safe about injecting where you defecate,” Asher said. For Asher and others in the realm of harm reduction, the time has come to give drug users better, safer spaces. ‘Despite the unsanitary injection conditions, users were driven to the bathrooms by their limited options. Darveaux visited the Corner Project’s office nearly every day and got her Hepatitis C treatment there. She also used the bathrooms to shoot up. She prefers to shoot up alone—which Garcia and others in the harm reduction world caution against—and the Corner Project allowed her to do so in a safe environment. Now, without anywhere to go, she injects on the sidewalk or in Highbridge Park. Despite the increase of opioid overdoses in recent years, safe consumption sites remain a source of public fear and opposition. Critics believe they cause more drug use and drug-related crimes. In an August 2018 New York Times op-ed, U.S. Deputy Attorney General Rod Rosenstein expressed these sentiments, claiming that safe injection sites would “destroy the surrounding community.” Safe injection sites are illegal under federal law and the Justice Department has vowed to take legal action if these sites do open. In addition to political opposition from high places, local residents are often the most vocal opponents to safe injection sites. Around the corner from the then-home of the Corner Project on St. Nicholas Avenue on a cool September day, soft-spoken Isobel Hernandez sat selling a variety of products on the street. “I wish they would move that place away from the center of the neighborhood,” she said in Spanish while motioning to the Corner Project. A sanctioned safe injection site in the neighborhood might attract more drug users and make the neighborhood even less safe, Hernandez said. Opposition to drug-related programs is common, said Wersching from Housing Works. For him, educating the public is one of the biggest challenges to implementing the centers. “It sounds radical and it might sound enabling, but really this is a harm reduction approach at its core,” Wersching said. He likens the campaign for Overdose Prevention Centers to the development of syringe exchange programs in New York City during the height of the AIDS epidemic. In the 1980s, advocates and non-profit organizations created illegal syringe exchange programs, causing public backlash from critics claiming that such programs condone drug use. Scientific evidence from programs in Europe indicated that access to sterile syringes not only decreased HIV transmission, but it also worked to curtail drug use. Still, the state and federal governments prohibited these programs. The underground network of syringe exchanges grew and in 1992 as the AIDS crisis reached an apex, the New York State Department of Health issued an emergency regulation allowing for the possession and exchange of clean syringes without a prescription. Syringe exchange programs remain contentious to this day, with 23 states outlawing them. The Washington Heights Corner Project’s mobile clinic. This mobile clinic, along with a few scattered tents in Washington Heights, are what is left of the Corner Project. Users loiter around the van with nowhere to go in the bitter winter cold. On a recent late-November afternoon, Mario Cuellar stood at his stand selling fake Gucci purses right next to the mobile clinic. Cuellar, 48, stands by the mobile clinic all day and sees the ebb and flow of one of Washington Heights’ busiest areas. He wants drug users off the streets and away from the community. 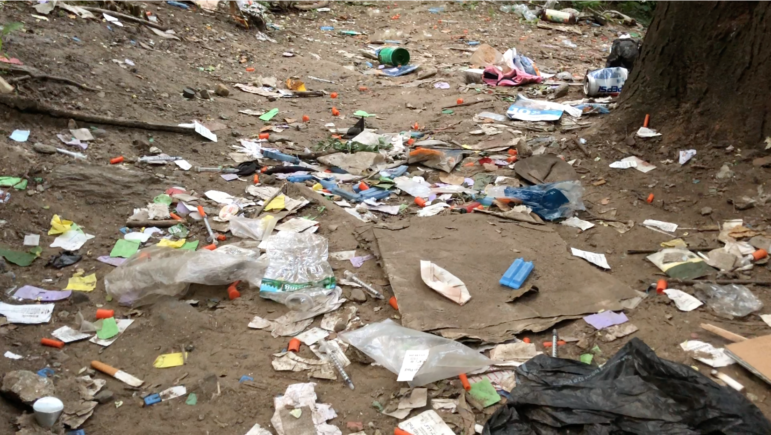 “It’s better for them to have a location because it’s unhygienic for them to be in public consuming drugs and using syringes,” Cuellar explained. Just a few feet away, Garcia stood on the sidewalk watching people walk by and greeting those he knew. Darveaux walked out of the mobile clinic. She also misses having a safe place to use. A few days before, the police walked up on her injecting on the sidewalk. Darveaux hid her syringe just in time, but it was a close call. As Darveaux walked away, Cardelle came out of the clinic and raced to a nearby single room apartment where she had to “take care of something.” She was clutching a blue naloxone pouch.